Duke Nukem Repository » Downloads » Maps & Addons » Duke 3:16, by Scott "Forge" L.
After a wild night (how the heck did that girl end up in his closet? ), Duke tries to take a well-deserved nap,but of course there's no such thing as peace and quiet in Dukeworld. Soon, the sounds of explosions disturb the silence and an angry Duke grabs his weapons, ready to teach someone a few lessons about being a good neighbour. Naturally, the city has been invaded once again and as soon as he leaves the house, he's welcomed by a whole bunch of trigger-happy pigcops. A medium sized citymap and also Forges first map. He manages to avoid some beginner mistakes, but not all of them.The design is very uneven: some areas look great while others look bland and sloppy. The biggest strenght here is the outdoor scenery. Forge managed to create a convincing looking ravaged city.Torn buildings, broken streets, neat spritework and a cool looking skyline in the background all help to create a superb, immersive atmosphere. Another great location is the factory (as seen in the screenshot below). However, many indoor parts don't reach the same heights. Some of them are too cramped, others just lookbland and empty and suffer from poor texture choises. Shadows and lightning are mostly lacking, and ambient sounds are also often absent. As a result, many of these areas look and feel unfinished. 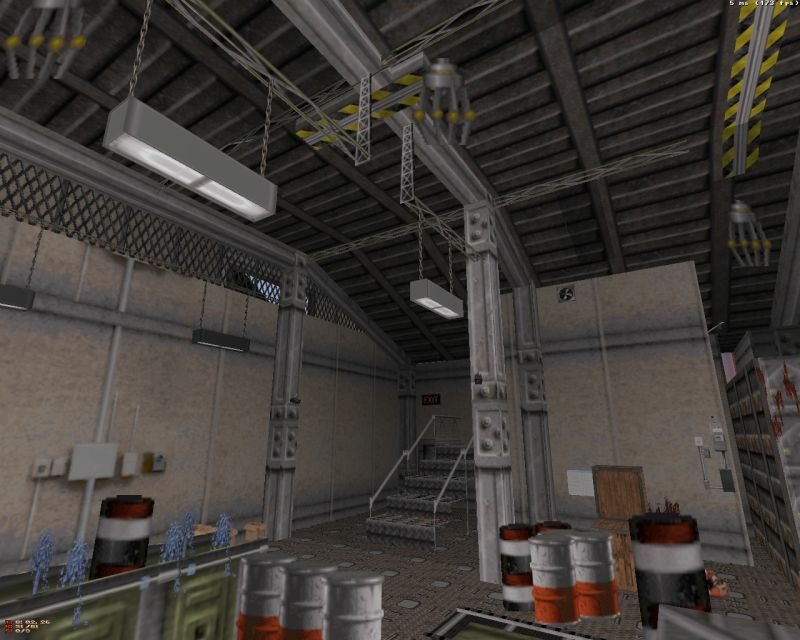 This also has a negative impact on the gameplay; towards the end the map starts to drag, as you navigateyour way through some bland buildings and empty looking hallways that seem to have no purpose. It's a shame, because the map starts out promising: the first half of the map offers a lot of fun and features some nicely staged firefights, although I wouldn't mind seeing some more health and ammo. Then there are 2 bigger issues: at one point there's a neatly designed puzzle. It's an original idea, but it's also very easy to screw it up, in which case you'll get stuck before you even know what you're supposed to do. It certainly would have helped to give the player some hints beforehand. Then there's the big fight at the ending. At this point, I simply didn't have enough firepower and I ended up fighting 2 minibosses with my pistol. Now, there's supposed to be a devastator hidden somewhere, but I never found it. Hidden weapons shouldn't have such a vital impact on gameplay. Conclusion: it's a hit and miss map. Some areas look great and show great potential, while others drag the overall quality down. Overall, it's still worth checking out though. For a first map, it's actually very good. Author                : Scott "Forge" L.
Other Levels          : This is the first. only way left out is through the tunnel at the rail 					station. so there's 				nothing special or innovative about it. that 					whosoever believeth in him should not perish, but continue to live. Additional Credits To : Special thanks to Frode "Puritan" Waksvik and Aymeric "MRCK"
also to what's left of the Duke community 			after over a decade of weathering. Construction Time      : About 120 hours over a four month period. while sliding down it, you might get yourself dead. normal; it's nobody's fault but your own. If you're desperate enough to steal from this map, then you're a sad, sad person.